You may think that accounting is a boring subject, but in the Internet world unusual business models are always interesting (or is it just me)? So here it goes. 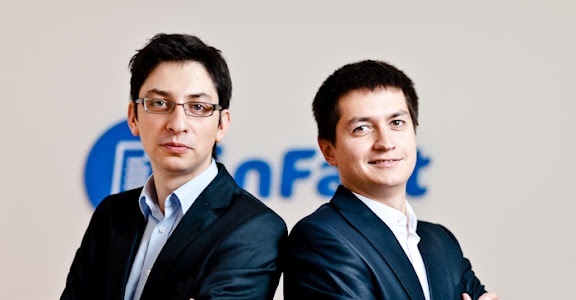 InFakt, founded by Wiktor Sarota and Sebastian Bobrowski started off in 2008 to provide online invoicing for small businesses and freelancers. (Please note that the king of free online invoicing company Tradeshift was founded only in 2009). Unlike Tradeshift, instead of expanding their reach geographically, the company decided to deepen relationships with its client base, by offering self-service cloud-based accounting tools and a new offline accounting service, which deals with receipt processing and bookkeeping. Here is how it works. On every fifth day of the month, a courier takes documents from an entrepreneur and brings them to inFakt.pl, where accountants enter them to the user profile and account for all the operations. The client receives an email notification about the taxes to be paid and obtains access to all current and historical company data. This service was coupled with extended hours of online support and 15-minute response time. Pricing was attractive, service was good and it got used by many. Now InFakt has 120 000 users of the freemium model and 200 daily registrations. Upselling traditional accounting services into the existing customer base was simple, yet every conversion meant Euro 420 annual revenue per client, up almost ten-folds. Granted, a business of picking up and processing receipts is low margin, but it compensates in volume: the company plans on grabbing 4 percent of the Polish accounting market by the end of 2014. Now think about what Tradeshift can become, to answer this Quora question. I would actually like to see Tradeshift buying InFakt and rolling out their model worldwide. A wishful thinking, I suppose, yet this would make existing investors Christoph Janz and Point Nine Capital very happy. Already now Tradeshift offers instant payments, as well as cloud-based procurement and branch management. It would also make sense for InFakt expand internationally. For example in Ukraine I have just learned, there are at least two startups going after freelancers’ accounting market such as FLP.ua and Gde Dengi, literally translated as “where is the money?” Ukraine has 46 million people compared 38 million in Poland, and a popular employment approach in Ukraine is to hire people as individual entrepreneurs, thus burdening them with accounting overhead, but saving on social security. Yet according to Janz, there is still much to do in Poland, so the company is not planning international growth any time soon. The time will tell whether Tradeshift, backed amongst others by Stefan Glaenzer, Morten Lund, Russian funds Kite Ventures and ru-Net, will go into the accounting space. In the meantime, InFakt, and this post are classified as success story.